Wow, where has summer gone? That seemed like a couple of weeks. But, when you are busy time flies and Full Throttle Media has been super busy. I and my team have been preparing a pile of video content for the launch of In the Spread. Boy, it just seems like we all put our heads down to focus on what we are doing and zoom, there goes the summer. Sorry for the lapse in updates. 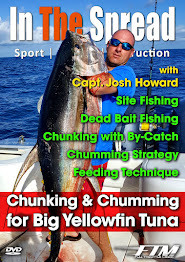 For those that don't know, yet, In the Spread is a sport fishing instructional video platform featuring some of the best of the best talent in the world. The guys and gals involved share everything they know about given species, tackle, techniques, practices, etc. Good stuff! There are some great partners on board, so stay tuned for more info. The launch date should be by the end of August.